Now you can join and learn circus skills without having to run away!!! The Powell River Gymnastics & Cheer Aerial Circus program is suitable for individuals 8 years and older. 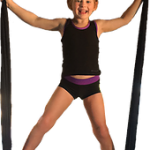 Circus arts builds confidence, imagination, and makes fitness fun for all levels. The magic of circus allows us to escape our preconceived ideas and starts us dreaming BIG!! It contributes fundamentals for personal and social development, as well as develops poise, strength and flexibility for all levels and ages. No Spaces in the Classes?? Ask us about starting a wait list. If we get the minimum required to open another class we will!! NOT SURE YOU WILL LIKE IT – OR CAN DO IT?? ASK US ABOUT DOING A TRIAL CLASS!! Do I have to be super flexible to do silks? Absolutely not. You use the silks in a variety of ways and gravity will do the rest. But we guarantee, your flexibility will improve! !